There are two Chernobyl tales with pictures, "Ghost Town" written in 2003-2004 and "Land of the Wolves" in 2005. "Ghost Town" was under attack from the very day I put it online. Many do not appreciate my efforts. Chernobyl is a disaster they don't want to remember; it is human made and it never ends. In 2004, my "Chernobyl" site was among the most visited sites on the internet. It was then when my account was blocked and papers all around the world started writing that I was a commercial trick, computer game advertisement, photoshop etc., I succeeded in hitting a raw nerve and I am proud about that. With all these experiences, I realised that one who wants to tell the truth must be able to stand for it, and this inspired me to create the second part of the Chernobyl story, "Land of the Wolves". There is "big money" to be made in the atomic energy industry. Just 1 kg (2.2 pounds) of refined uranium would produce about the same amount of energy as 50 freight cars fully loaded with coal (3,000 tons). Refined uranium, therefore, has nearly a 3 million to one advantage in shipping weight compared to coal. This naturally attracts powerful, big-money political and business interests who do not give a damn about the safety of reactors and the health of people. Their only concern is driving profit by milking a cow, so they put it into harness, urge it with a whip and milk it without limit. The outcome is always the same—instead of milk they are squeezing out blood. No matter how hard they tried to discredit my site, the story is still here, and more people continue to read it. I am not pro or anti-nuclear activity, I am just a pro-human author, who thinks that Chernobyl is a warning to mankind. I do not think that the atom itself is evil. It only becomes evil in human hands. Under the right conditions, atoms can serve humans, under conditions where there are no wars, when the atom does not belong to Communists, Islamites, or Capitalists. The problem is that the life of nations is nothing but wars and tumults; the peaceful years appears only as occasional brief pauses and the Communists, Islamites and Capitalists are always the first who try to possess the atom. IT IS AN INEXCUSABLE ERROR IN DESIGN OF HUMANS THAT MAKES REACTORS DANGEROUS. My interest in Chernobyl began in 1992, when I first travelled through Belorussian villages north of the reactor. I was young and I was impressed. What struck me most was some of the dark beauty of the place; the beauty that others could not see. Hotspots, such as Vilcha, are a common name for all areas contaminated with Chernobyl radiation. 60 curie of cesium was measured in 1991. The level of radioactive isotopes of Plutonium was measured to be 0.7 curies/ square km. Strontium was measured at 15 curies/ square km. By Chernobyl standards, Vilcha is a typical "hotspot". On a page about "Red Wood". When I said, it would glow in the dark, I was kidding. Radiation is not seen. It's just a common expression. Extremely high radiation can be seen on some videos, depending of brand of the film. It appears as a little sparks. Radiation is seen on the video, "Last day of Pripyat" The author of this video, Michail Nazarenko, was making a film about an atomic plant and happened to be in Pripyat. He also filmed the evacuation there. During the evacuation, the official level of radiation in Pripyat reached 1 Roentgen per hour. People said it was 7 Roentgens. This makes a difference, because in first case, the population would die within two or three months. In the second case, people would die within a week. I believe both claims can be right because, in the first weeks of fallout, surface radioactivity on the streets can measure much higher than radioactivity in the air at eye level. My stories describe how I saw Chernobyl some 17-19 years after the accident, so I didn't update any info about radiation levels, number of people living in the area. Some of the photos are not mine. I've placed them on my site with the permission of their respective authors: Richard Willson, Philip E. Berghausen, Alexander Sirota. I have to thank everyone who helped me with this site and those who still help. The scientific part of this story, relating to the radioactivity of Americium, is an incredibly complex field and it is almost impossible for anyone to get it right. The difference between radiation tests in laboratory and radioactivity in life is as big as between a shooting range and combat. My observations are based on experience and my approach is always practical. The radioactivity we see with a geiger counter is a combined result of all types of radiation which is one really complex cocktail. Am-241 is one of components of this cocktail, under different circumstances it can be more or less harmful than Pu-241, for every element is harmful in its own way. However, both elements are alpha emitters, both emit gamma rays as part of their decay process. Depending on their initial energy, gamma rays can travel in air and are detectable with a geiger counter. For me, as for any traveller, the element that emits the stronger gamma rays is the most harmful, such as Americium. 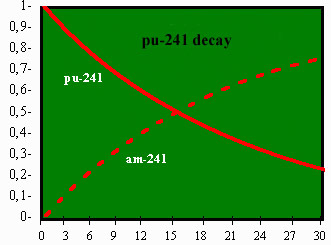 Below is an approximate graph that shows the decay process of Pu-241 creating the accumulation of Am-241. Mass is on the vertical scale. Time is on the horizontal scale. Unfortunately, the photo of "Elephant foot" in of bad quality, as all pictures of this miracle it is taken with remote control. No one goes inside of that room, because radiation is about 10.000 roentgen per hour. The "Elephant's Foot" is the biggest formation, but it is really a small part of all the fuel that was in the reactor. 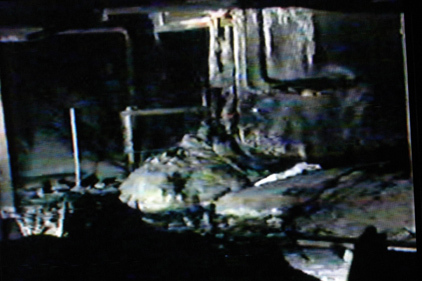 The explosion forced down the reactor's base and melted material poured out of the reactor vessel and spilled into the rooms and corridors below. In this way, the reactor is empty and fuel is not concentrated in one place. This was sort of good news, because it reduced the chances of another chain reaction. The pictures below make it easier to understand how the reactor was built and where the fuel is now. That radioactive magma has glassy look, because fuel was mixed with sand that was routinely packed around the reactor vessel. If someone want to learn more, here is a video that was taken deep in a basement of reactor No.4 and shows the Elephant's Foot. The amount of fuel that is left under the sarcophagus is a subject of discussion among scientists. It is hard to explore all rooms and corridors, because radiation levels can be up to 1000 Roentgens and higher. Scientists run, when they pass such a highly radioactive place. 1000 Roentgens kills a person in just one hour. Protective suits are not effective. There are no means that can protect humans from this level of radiation. Until the ill-fated day of 26 April 1986, Chernobyl's power plant was a success. It's energy output exceeded all expectations and it's safety record was unstained. 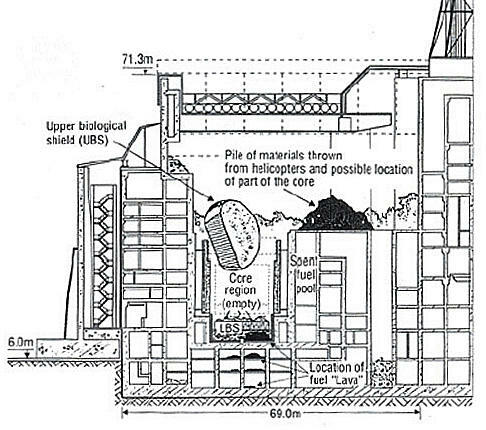 The Chief Engineer who designed Chernobyl reactor used to brag that this type of reactor was so safe, that it could be built in the Red Square in Moscow. Chernobyl plant was providing 2 millions people with electricity and night time was the best time to run experiments, because the energy consumption was at the lowest level. When the "safety experiment" was scheduled to run that day, control operators were about to run this business with the same confidence as always. 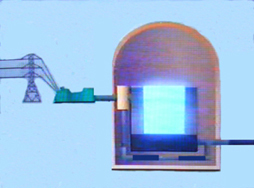 The purpose of contest was to evaluate the reactor's response to a "loss of electrical power". What they failed to understand was just how unstable their soviet design of reactor would become when operating at low power. All reactors operate under the following principle; in the presence of uranium fuel, neutrons split the uranium atoms and initiate what is called a "self sustaining chain reaction". The energy released heats the fuel, waters circulate over this fuel, some of it turns to steam and power the turbines which generate electricity. Then all the waters recycle and return to cool the core. At Chernobyl's reactor number 4, the uranium was contained in seventeen hundred separate tubes surrounded by blocks of graphite that helped to keep the chain reaction going. Control rods absorb neutrons and slow the chain reaction. They are raised out of the core to increase power and lowered to decrease it. For safety a minimum of 30 control rods should remain at the core at all times. This rule is a must. At all phases of the operation of a reactor, its capacity for nuclear power generation must not exceed the ability of the controlling rods to suppress the chain reaction. Those 30 rods are located in a zone where they have the greatest effect on the core's ability to generate power. The cooled water absorbs extra neutrons and helps to regulate the rate of the chain reaction. The danger of this reactor's design is that if the water is lost, or boils away, the extra neutrons can speed up the chain reaction until the reactor is out of the control. This is what happened at Chernobyl. After the rupture of lower water communication lines, which carried cooling water to the core, the nuclear reactor was left entirely without water. The explosions first occurred in the fuel channels of the reactor, as they began to fall apart from the massive increase in pressure. How many steam explosions there were is unclear. Some say there were three or more, then came the final, most terrible explosion of the detonation of the gas in the core. 1) There were only a few (maybe less then 10) control rods in the reactor at the time, rods which could instantly move to counter a reactivity insertion. 2) The shut down rods went in slowly—acceleration about one fourth of what would be in free fall (g/4) in contrast to being driven in very fast as they should be. 3)To save money the tip (1 meter) of the shut down rods was GRAPHITE! This gave an instant positive surge of reactivity which could not be countered for perhaps 1/20 second. Among other defects, flaws and failures worth mentioning is the absence of the cap (secondary containment) which prevented a similar catastrophe on Three Mile Island in the United States. Soviets were told many times that atomic plants with no caps are dangerous, but they kept building those plants, because it was 30% less expensive. After explosion, the only way to slow chain reaction was to bomb the reactor from helicopters with neutron absorbers and other chemicals. Soon after that, many of the brave pilots died. Their photos and videos have survived. Click here for video of helicopter. Here is a video that shows "biorobots" at work, it their final stage of cleaning the roof. A six minute video of Vladimir Shevchenko, called "The Severe Days". Below are photos of our May 1st "milliroentgen" parade. It probably was only parade without party bosses and members of their families taking part in it. As is true of all times, "first class passengers" left the sinking ship first, so their families left for Kiev on April 26, as soon as they learned about the explosion at the nuclear plant. No one was punished for hiding the truth from people. Only the guys from the nuclear plant were punished. A group of six atomic plant personal have been sentenced to different terms from 2 to 10 years. Only the Deputy Chief engineer partly admitted his guilt. "I was guilty but so was the system", he said. In 1991, the Soviet Union has collapsed. 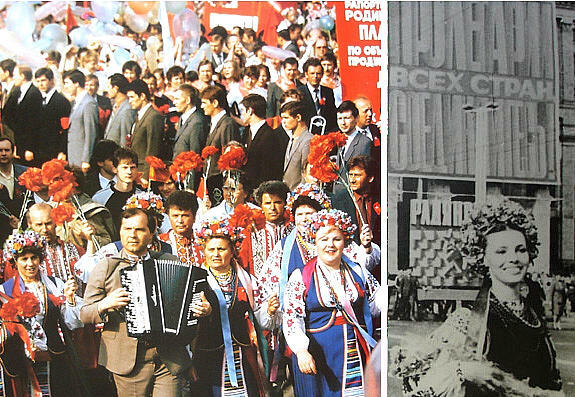 Since then, things have changed: communists became democrats, Komsomol leaders became businessmen, judges and prosecutors became politicians and government officials. What became of the people who once trusted to their leaders and went out to clean up the area around the reactor? Each one, left alone with his or her own cancer, knows that he or she will die and after his or her death, the toll of victims will still remain at… 31 !!! Materials from this site can be printed, copied and translated or used for any purposes, no rights reserved. My aim is to show these pages to as many people as possible.